Location: Picturesquely situated on the two banks of Devinska River, in the Western Rodophi Mountains, the town is famous for its favourable climate and meditative thermal waters. Devin is located 196 km away from Sofia, and 40 km from Smolyan. It is only 35 km from Pamporovo ski resort. It is known as the best SPA resort in the Rodhopi Mountains. The water in the resort is slightly mineralized / 37- 44 C/, fluoric and has a pleasant taste. 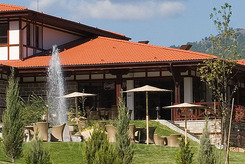 It ensures year round conditions for recreation and treatment amongst beautiful nature and fresh Bulgarian Mountain air. History: Devin existed as a sanctuary and early settlement as far back as Thracian times. More about the historical landmarks of the area can be found in the Museum of History in Devin. An interesting place to visit is the Medieval Necropolis from 13th- 14th century, unearthed in the centre of the town. SPA & Wellness: Devin Balneological resort is known worldwide. Devin has a great number of sunny days throughout the year, extremely mild winters and cool summers and fresh air. A balneosanatorium and an open-air mineral water pool are built to meet the needs of the healthy holiday-makers. Devin mineral water, bolted in the town, is extensively used for drinking and is ecologically pure. 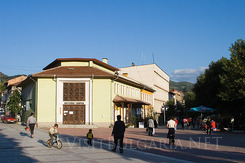 Vicinities: Bedenski Mineral Baths – a mineral water destination as well, is located about 10 km from Devin. The Village of Mihalkovo is situated 20 km from the spa resort and has naturally aerated mineral water spring, which is actually the most carbonic acid water in the country. An interesting landmark is the village of Shiroka Laka. It is an architectural and historical reserve with more than 60 national revival period houses, representing the typical traditions and customs of the warm Rodophean people. This region is also popular with the attractive festivals held here. Some of them are the Koukeri Festival and the Bagpipe Playing Competition in the village of Gela. Natural attractions near Devin are the impressive Trigrad Gorge, Dyavolskoto Garlo (the Devil’s Throat Cave) and the unique Yagodinska Cave.